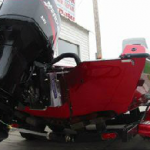 Is your boat ready for the open water this season? 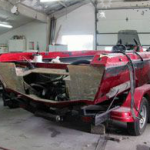 Is your boat showing wear from years of trailering, rocks, and docks? When your boat’s surface has been scratched, damaged or the paint has started to chip, it can compromise its structural integrity. Like all boats, they require care and attention. Check periodically for serious dents, cracks and loose rivets at points of stress. Don’t wait for it to get worse. Hulls can need repair as a result of damage, delamination, or deterioration from water or sun exposure. 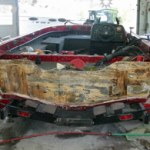 Cracks, holes, soft areas, and crushed fiberglass can be repaired or replaced extending the life of your boat many years. We can work wonders with damaged fiberglass. Before you conclude that your boat has seen its last day in the water, see us. It may have many years of life left in it! The transom of a power boat is the strongest part of the vessel. It has to transmit the full power of the engine to the rest of the hull, as well as carry the pounding of the hull back to the engine. The great forces exerted between the engine and the hull come to a focus at the transom. 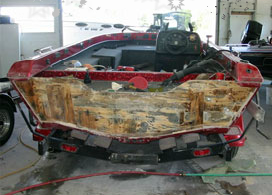 Eventually, the transom may deteriorate and weaken to the point that your boat is not seaworthy. Your boat is not lost if the transom has lost its integrity. We can either strengthen it or replace it altogether. This job was extremely challenging, as the transom was replaced without removing the deck and it required blending of the metal-flakes. One of the most commonly overlooked, but probably most important, pieces of boating equipment is the boat trailer. Without the trailer, the boat would not make it to the water. Trailers consist of a frame, axles, bearings, hubs, tires, runners, rollers, winch, and lights. Some boat trailers are equipped with trailer brakes. Each piece of the trailer is important and demands periodic inspections. Your trailer is very important part of the entire boating experience. Make sure your trailer is road and boat worthy. 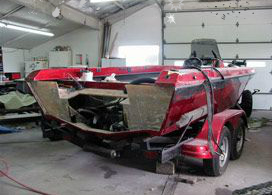 If your trailer has problems it could damage your boat or leave you stranded costing you time and money. Make sure this doesn’t happen to you. 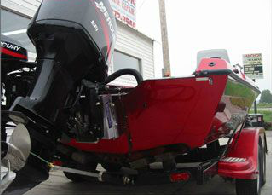 If your boat is important to you, contact a reputable Minnesota boat repair company that has experience in collision, structural, and storm damaged boats.